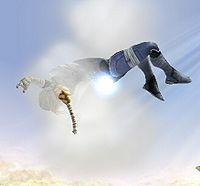 Sheik disappears in a flash of light. Vanish (浮身, Floating Body) is Sheik's up special move. It involves her throwing a Deku Nut and vanishing into thin air. The basis for the move in Ocarina of Time. Sheik often vanished in The Legend of Zelda: Ocarina of Time, much to Link's bafflement. However, sometimes fire or sand concealed her disappearance while she quickly threw the Deku Nut on the ground. Impa, the only other Sheikah in the game, could perform this ability; it is one of the "Sheikah arts". Based on the effect of Deku Nuts in-game, it is implied that Link was paralyzed by the Deku Nut and regained his senses following Sheik's departure, unlike Vanish necessarily involving Sheik teleporting. Sheik reappears above in a cloud of smoke. Using the Control Stick, the player can determine where Sheik will reappear by tilting in a certain direction. Vanish does not go as far as Farore's Wind, but Melee players occasionally transform into Zelda to gain greater recovery distance by using Zelda's Farore's Wind to recover, transforming back to Sheik once safely on stage. This is much more dangerous in Brawl, as the transformation time takes much longer, generally leaving Zelda too far below to recover. The initial explosion deals damage and knockback, and is capable of KOing at around 120%, but has noticeable startup lag. However, Sheik is granted invincibility frames during the start up lag. The re-entry of Sheik's Vanish has a very small push effect. This can be seen as it moves an opponent further than simply landing on them would. It has just enough push to knock someone, standing near the edge, off it, causing them to cliff-hang. This can be used downwards, in the air to stop potential ground guarding. On the ground, this can be used to mess with opponents and clear space when fighting close range. In Super Smash Bros. 4, Vanish now causes damage to any opponents Sheik touches when she reappears, which, compared to the first hit, deals less knockback and doesn't cause flame damage. However, both explosions now have energy properties and are susceptible to moves that can absorb (such as PSI Magnet). In midair, Sheik now flips and rises a little before Vanishing, slightly increasing the move's distance, and in some cases, let her grab the ledge before even disappearing. "Throw a bomb to the ground and warp in any direction. Deals some damage." "An ultra-swift teleport. No attacking ability at all, but makes up for it in sheer speed." "A stealthy leap that has a meteor effect on any opponents in its path." Gale (known as Instant Warp in the PAL version): Faster with increased movement range but no explosion or damage potential. Abyss: Explosion knocks upward with a meteor effect. Possible to hit enemies again after initial explosion. No height gain before explosion. Reappearing in Super Smash Bros. for Wii U. Vanish as shown by a Skill Preview in Ultimate. Since the explosion graphic and hitbox stays behind while Sheik moves, it is technically considered a projectile. This page was last edited on April 11, 2019, at 23:42.